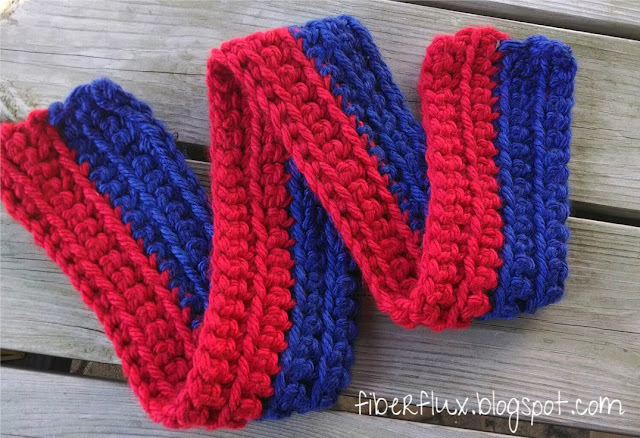 This scarf is perfect for frigid days when your little man needs to stay warm. Made with just four rows of each color, you can be finished in time for a winter nature walk or a snowy play day. The Little Man Scarf is crocheted lengthwise and working in the front loops gives it a slight ribbed effect. If can very easily be made in any length depending on your beginning chain and any width by simply working more or less rows. Perfect for little men of all ages and sizes! Note: You will have leftovers from each skein if you choose make the scarf in the size shown. Ch the length of the scarf desired, plus 2 more ch. (Scarf shown here began with 70 chains, I simply made a chain that was the right length for the little man and kept track of the chain count). Foundation Row: In the 2nd chain from the hook, work 1 sc in each ch. Row 1: Ch 1 and turn. Work 1 sc in the front loop only of each sc from the previous row. Repeat row 1 until scarf is desired width. Note: For color-block effect like the scarf shown, work the beginning chain, foundation row and next two rows after that in color A (blue). Then work next four rows in color B (red). If you choose to make your scarf a different width, adjust striping accordingly. Click here for Outline Scarf pattern! Can I just say that your site makes me want to do nothing but crochet....I love the patterns you provide! Thank you so much for sharing! Thank you! This one was a big hit! Thanks for sharing, it looks gr8 !!! Love this pattern. So cute and easy to make, I finished one last night for my little 2 year old in the same colors you used. Sometimes when I crochet a scarf it seema to have a slight curve. Any idea what I'm doing wrong?